NWEA MAP growth is based on two ingredients, VOCABULARY and SKILLS PRACTICE. 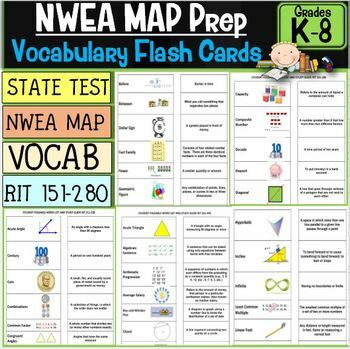 This NWEA MAP Prep Math Flash Card set utilizes the vocabulary needed to increase NWEA MAP, State, and local assessment scores. 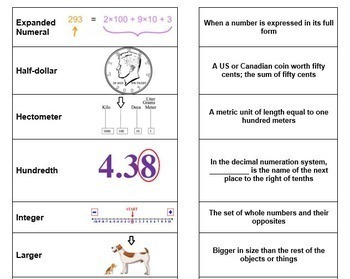 The math vocabulary words in this bundle were taken from the NWEA MAP site for every RIT band and are matched with specific grade levels listed below. Over 288 words, definitions, and pictures included! This critical vocabulary will also be found in state and national tests including; ACT, MAP, NAEP, Smarter Balance, Park, and many others. 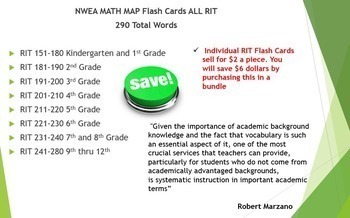 This product contains every vocabulary word, definition, and picture from NWEA MAP Math Rit 151-280 formatted as a fold-over/flash card set in Word. 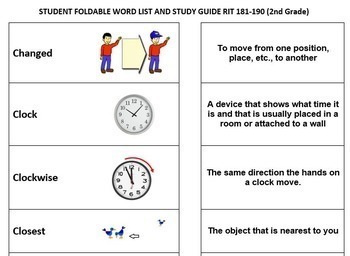 This will allow your students to study critical MAP vocabulary in the every RIT band at school or at home. Help your students climb the growth ladder today! Thanks for stopping by our store. Every new product we put up is half priced for 24 hours. Be sure to follow our store to receive updates on new products!